ChainLink Research : Research :Happy New Year - Converged, Collaborative, Telepresent Communities in the Second Decade:What's happening in 2011? Convergence - Unified Applications and Devices for the Second Decade. A platform convergence is driving the mobile business market. It is hard though, to call it ‘the mobile market’ when we are now putting business applications on the platform. And it is hard to call it a mobile platform with all the touch tablets/ iPads, Androids, PCs. These platforms will be ubiquitous in the next few years. That echo-chamber effect is occurring, with apps for the platform and a platform for the apps. The movement of Unified Communications is about deploying voice, video, web, Scanning, RFID, data etc. on devices. Applications, Service, Content access across every industry–none have been unaffected. If we look at Figure one, this convergence is in full force. RFID frequencies and standard groups like DASH7 and NFC are developing a device that puts this on your smart phone. Mobile carriers have already featured apps for scanner/bar-coding that link to web content and services. Telepresence /Web Conferencing is on mobile platforms: both smart phones and touch/pad devices. And traditional application providers in the enterprise are porting and developing new apps on the mobile and touch platforms. NFC. Finally we are seeing the big-rollout of smart phones with the NFC, within which firms such as Nokia and Google are making big announcements and commitments. The phone will have the three protocols that will allow the phone to act as a card, a reader, and an ID device. Think about it. On the same device you can scan barcodes, find things, pay for things, etc. Convergence of Active RFID and NFC on a single device. Active RFID will deploy a standard called Mode 2 which is a radically different device than the rusty Active RFID (433MHz) of the past. And the combination will allow for longer range auto ID indoors or out, as well as the commerce and security features of the NFC capability. Smart phones will also be the platforms for conferencing—video, that is. In a world of diverse devices, the cloud becomes the essential interoperable integrator and arbitrator. Phones and Bar-coding. Both the tag and the readers. Savvy air travelers are already using their phone for boarding passes, and shoppers can access a host of coupons—thus eliminating all that paper! And of course Microsoft’s new Lync product. Tablets and touch—these types of products will also reduce paper since products like TeleOffice have interactive white boarding that allows mutual users to draw on the same document. Not just Apple, but Sharp, Samsung, Toshiba and HP to name a few (Androids, of course) will be in full force. Touch has gone big screen video, as well in the conference room and entertainment, for example, well seen by watchers of various news and TV programs. You can now have this in your office. The reader - They are not the reader of yore! Phones with RFID can be not only the reader but also communicate that data into the cloud. Wireless/ZigBee readers can send the data corporate side, or into the internet. Solution providers are going beyond just porting components of their client applications by developing new apps for this environment. Of course there is Saleforce.com’s Chatter, which converged Social Networks, SF.com data, documents, etc. And firms like JustEnough, with their new app, converging forecasting, sales, locations-based services and conferencing on iPad, is the paradigm that will be exploding in the market. They partner with NetSuite (who also has mobile capabilities for sales and inventory management). Syspro, and of course SAP and Oracle, have been at this game, with SAP’s prescient purchase of Sybase in 2010. Being out of the office but still connected, has huge benefits to many of us who are mobile: visiting clients, attending meetings off-site, and generally traveling. These activities bring forth the blending of personal and business apps. For example, seeking out the routes and weather conditions, good restaurants, driving instructions, airport delays, etc. are common queries for many of us today. But in addition, that last minute slide that your team wants you to show the customer can arrive while you are mobile—no PC seeking wifi. The applications world has been radically transformed with Social Networks and mobility. No more the domain of software firms behind motes of management, requiring big investments to launch, some of the most popular applications have been written by innovative individuals, who use app platform tools and register these with the providers (examples are QT with Nokia and with Apple). Service offerings have also transformed. Anyone can develop a following on-line and offer services. Of course most of the services we seek require substantial effort and often global reach (Location-Based Services, for example). This explosion of services and apps, the huge democratization of the tech world, represents both the threat and opportunity in this new world. 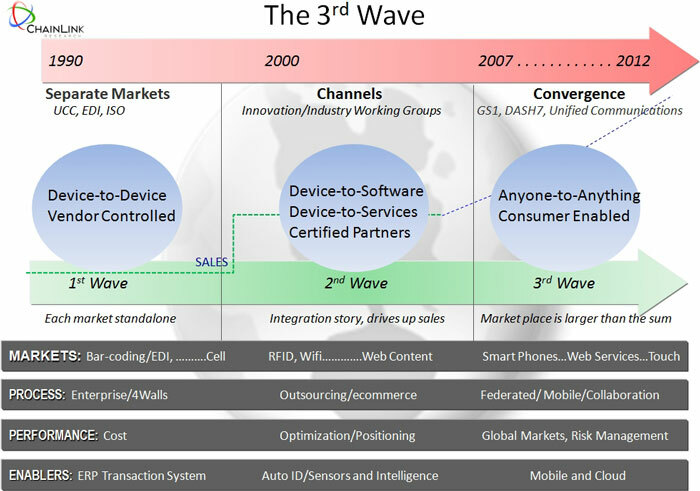 We see the tech market having passed through three waves (Figure 2). In our first wave the applications are all controlled by one provider, who is responsible to the end points of the app, devices and channels. As such, they can test and test and assure that all the elements work seamlessly. This works in an environment where we have single corporate buyers whose needs are proprietary. They need some corporate integration, but the needs often don’t extend beyond their four walls (often called closed loop). Each market then must sell on their own. For example, the barcode sold printers, scanning, labels, etc. This, in our opinion, actually limits the size of not only each market segment, but of the total. Take a quick look at history and you will see that markets like bar-coding are not shrinking in this new market, but growing. NO doubt certain companies are more successful; the competition will be stiff. But savvy companies will assure that they are a focal point for the second wave! Vendor-driven strategy needs to give way, since their customers have broader considerations. They need integration and flexibility. The second wave then addresses the needs of expanded applications and catalyzes the ‘partner network.’ This phase is one where providers seek each other out and create some standards to interoperate within their domain. So certifications for these ‘vendor centric’ environments dominate. Customers like assurances that now the solutions are coming from a group that they will still work with. There generally is a ‘center’ that sees to this assurance. Great examples of this are firms like Motorola on the device-side, Intelligent Insites as a platform provider, and, of course, most successfully Salesforce. com. Standards groups thrive and drive here, as noted above: the GS1s, DASH7s and NFC Forum. So What Is the 3rd Wave? 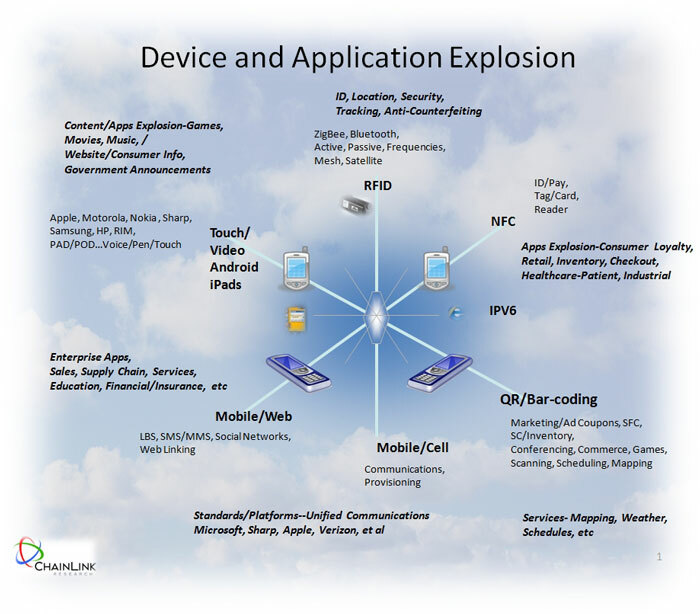 Now as we discussed above, we have this explosion of devices, apps and services. Not just corporate users, but more importantly, consumers can download (often for free) these capabilities. So who controls the center? Who assures they are secure, that they work together? How do we assure good customer experience, and prevent a total turn-off with the mess we create? We are not sure. This is the era we are entering. We do have history to teach us, though. When the internet exploded (remember the PC/Internet combo) we worried about many of these issues. CIOs worried about users bringing their PC to work. They needed to learn to manage the opportunity. We have open source as another example. We can learn from these with our Mobile/App combo world, too. The Convergence is like a rodeo horse, hard to understand where it is going and hard to control. Convergence catalyzes a larger totally addressable market, one that is larger than the individual components could be. Just as the highway system in the US enabled service stations, fast food and hotel chains, the suburbs, as well as the explosion of the auto industry, so does this convergence market. Although one would debate whether the auto catalyzed the highway systems or vice versa, that is the point anyway, the convergence catalyzes mutual growth. Over this coming year we will delve into this market and make sense of it. Most of the media and market views are specific to one of the segments (Figure 3). Mobile market analysis tends to look at the devices and carriers and things like traffic. And then we have the sprouting up of more magazines and web sites in the app world. But that app world is different than the applications world (as in enterprise). And then there is the PC market. Then we have industry applications segments like retail and healtchare. And then there is . . .
Creative/Technology—Hardware, apps/software, content providers and services. 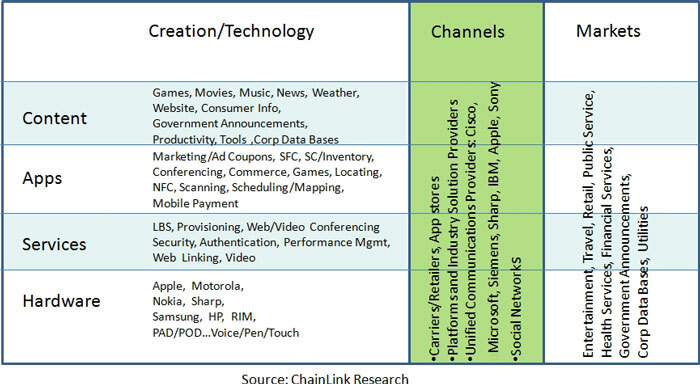 Channels—There are all sorts of companies that do not create these technologies but certainly leverage, then resell them, or benefit in some way from them and include them in their application or service offerings. And the industries—These usually come to the end-user as a full solution with an industry package. A smart/phone scanner for transporation will look very much like a retail variety, but many of the apps will be different, for example. Or a healtcare solution may have different power requirements, etc. It’s exciting to see this surge of creativity, functionality and versatility! Of course it is a huge opportunity and probably a threat to IT management, if they don’t get with a policy pretty soon to deal with this new wave of devices and apps.